Soviet dictator Joseph Stalin was so angered by John Wayne's anti-communism that he plotted to have him murdered, according to a new biography of the Hollywood legend. 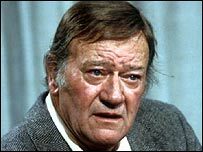 John Wayne: The Man behind the Myth, by British writer Michael Munn, says there were several attempts on the actor's life in the 1950s. In one instance, the book says, two Russian hit men posing as FBI agents visited Wayne at his office in Hollywood - but were foiled by real agents who knew about the plot. Mr Munn told BBC News Online that he pieced together the truth about the various attempts through interviews with Hollywood figures - including Orson Welles and Wayne himself - over the past 30 years. Mr Munn said Stalin was enraged when he heard about Wayne's anti-communist activities in the late 1940s - when Hollywood blacklisted those perceived as Soviet sympathisers. "Stalin decided Wayne had to die," Mr Munn says. However, he adds, the FBI got wind of a Soviet plot and was prepared when two hit men called at Wayne's office at Warner Brothers studios in 1951, posing as federal agents. The book says the would-be killers were captured, and later requested asylum in the US. It also says the Soviet campaign was cancelled after Stalin's death in 1953, because his successor Nikita Khrushchev was a fan of the film star. 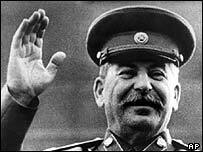 "That was a decision of Stalin during his last five mad years. When Stalin died I rescinded that order," the book quotes Khrushchev as telling Wayne during a private meeting in 1958. But the book says American communists took up the cudgels against Wayne - who was also known as the Duke. Mr Munn says that in 1955 a group of communists based in Burbank, near Hollywood, plotted to kill him. However, he adds, a group stuntmen loyal to the Duke raided the premises of his Burbank enemies and "ran them out of town". Mr Munn also says Wayne told him in 1974 that he survived another attempt by a sniper during a visit to US troops in Vietnam in 1966. Wayne died of cancer in 1979. The book, published in London by Robson Books, covers many other aspects Wayne's life and career - including his meteoric rise, unsuccessful marriages and difficult relationship with his children.